Meet Britain’s youngest teachers – the babies who are visiting primary school students in order to help them learn about empathy. The three babies are all children of teachers at Ardgowan Primary School in Greenock, Scotlan who are on maternity leave. Once every two weeks, the babies are brought into school to meet the pupils. The tiny tots, ranging in age from 3 to 10 months old, “teach” the schoolchildren by allowing them to see the babies grow and develop, and learn about empathy, understanding, and responsibility. The idea originated from a Canadian organization called the Roots of Empathy project. With all of the babies being at different stages of development, curious primary pupils are encouraged to ask questions about what they like to do and how to manage them. 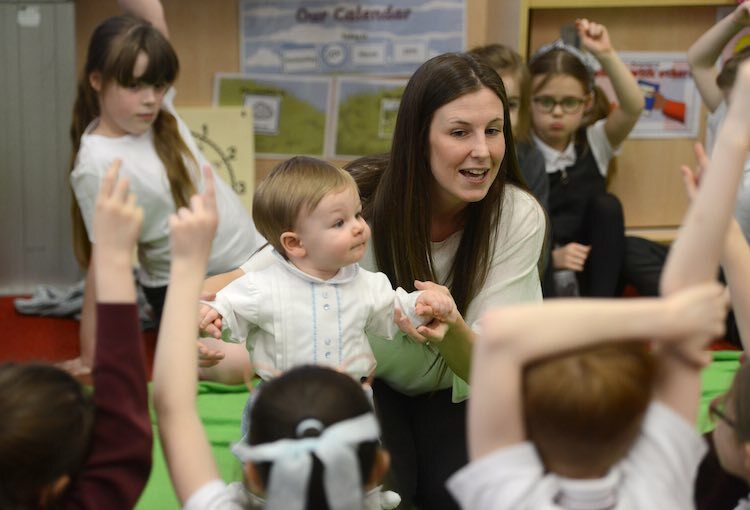 Stacey-Lee McLellan, who brings her 8-month-old son to the school for the lessons, says that the troublesome pupils are often the most receptive to meeting the babies. Another one of the momma teachers, 28-year-old Charlene McClusky, says that since her students love to ask questions and hold the hand of her infant son, the lessons have helped the newborn boy be more confident. McClusky, who teaches sixth grade classes at the school, said: “They ask us lots of different questions about what the babies like to do, how we look after them, what to do if they’re being grumpy and they just love getting to know the children and see how they grow and develop. The benefits of the bi-monthly visits have also been seen by third grade teacher Roly Srivastava. “It has taught the children a lot. They have been able to see the development of the children and they’ve been able to understand how much hard work it is to take care of a child, starting from when they’re babies,” said the 57-year-old teacher. “They’ve learned more about babies and how they are themselves growing up. And they’ve learned more about each other’s feelings as well,” she added.